In January, I passed the sad remnants of a bicycle that had been involved in an accident with a car (I hope the cyclist is ok) on the boulevard de l’Industrie on my way to work. It was not a comforting sight, even though I know that there have been no casualties among cyclists in 2012 and 2013 inside the Brussels region. Is it relatively safe in Brussels to ride a bicycle? Nobody knows. Neither the Brussels region nor the Belgian federal authorities collects reliable data on the share of trips by bicycle or the length of those trips. The data on the number of injured cyclists is distorted by underreporting, so it is impossible to judge whether a change in these figures is meaningful. The number of cycling fatalities is (fortunately) so low in Brussels that it cannot be used to monitor changes in safety for cyclists. A fact is that Belgium as a whole had the second highest number of road fatalities per inhabitant in the EU-15 in 2012 (only Greece scores worse). Twice as many people died on Belgian roads per inhabitant as compared to the Netherlands, UK, Sweden or Denmark. Then again, the Brussels region had the lowest number of road fatalities per inhabitant of all Belgian provinces in 2012, a similar level to that of the Netherlands. But Brussels is a city and the Netherlands is a country. Urban areas typically have lower road fatality rates as vehicles are forced to slow down by congestion and speed limits. It is unlikely that the behaviour of people driving in Brussels is much safer than in the rest of Belgium, especially given that many of these drivers live outside Brussels. The infrastructure in Brussels was primarily designed in an era when accommodating more cars was the only concern and this is changing only very slowly. The maintenance of the road infrastructure is also poor (and fragmented over 19 communes and 1 region). For the six different police zones enforcing traffic laws to improve safety is a low priority. So what is my conclusion? Riding a bicycle in Belgium is probably dangerous, but Brussels is one of the safer places to do so. Not because drivers are well-mannered and considerate. Not because the infrastructure is good or because the police is targeting dangerous drivers. Just because drivers cannot go fast enough to be as dangerous as they are in the rest of the country. 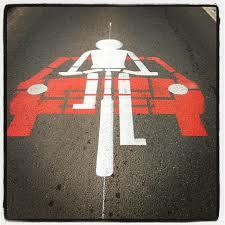 So please remain careful while you ride and support our call for a change in the driving culture in Belgium. When my kids were small, I asked a lady who transported her small children in a bicycle trailer whether that is safe in Brussels. She replied quite seriously: “Yes, it’s safe. I’ve had only one accident in 3 years”. I did not follow her example.